Just In! BCCI declares a 15 member India Team Squad for CWC 2019. The Board for Control Cricket in India held a selection committee meeting in Mumbai to announce the Team India squad that will be playing in ICC Cricket World Cup 2019. As declared by the BCCI, Virat Kohli will captain team India in the Cricket World Cup 2019. Rohit Sharma and Shikhar Dhawan have been selected as the batting specialists, they will probably open for Team India in this season of World Cup. Rohit Sharma and Shikhar Dhawan are a good section as openers. While, the skipper Virat Kohli will himself take charge in the middle order along with Kedar Yadav, Vijay Shankar and MS Dhoni. The Ranchi Boy Mr Dhoni will also be wicket keeping for the India in the ICC Cricket World Cup 2019. 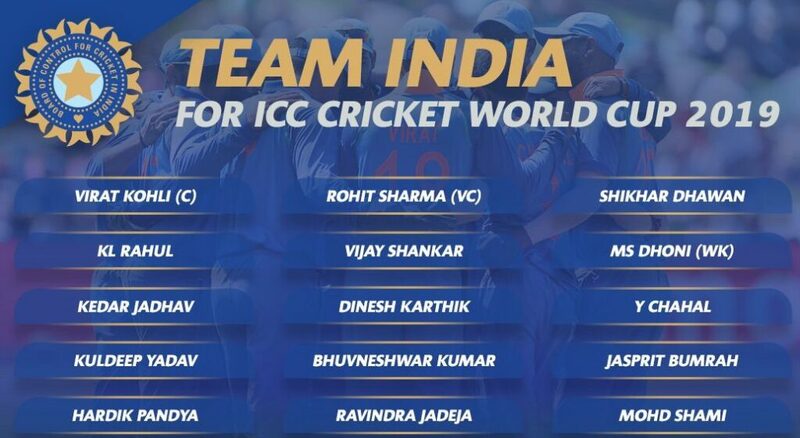 Apart from it, Jasprit Bhumrah, Bhuvneshwar Kumar and Mohammad Shami will take charge on the opponent batsmen in this season of world cup for the team India. This is a well balanced team squad for Team India in CWC 2019. Who could say, if India retakes the Cricket World Cup from Australia. The ICC Cricket World Cup 2019 is scheduled to be held in England & Wales from 30th May. The cricket fans are eagerly waiting for the magnificent cricket tournament. Stay tuned! for more updates on Cricket World Cup 2019 news.